previous post: Time to nationalise superannuation in Australia – even conservatives think so! next post: The ‘infinite-horizon fiscal gap’ is just an infinity of nonsense – try measuring that! One of the major claims the founders of the EMU made was that by creating an independent ECB – by which they meant ‘independent’ of the influence from the Member States or other EU bodies (such as the Eurogroup) – they were laying the foundations of financial stability and disciplining the fiscal policy of the Member States. This so-called independence was embodied in the – Treaty on the Functioning of the European Union – where Article 123 prevents the ECB from giving “overdraft facilities or any other type of credit facility” to the Member State governments (and other EU bodies); Article 124 prohibits any Member State government (and other EU bodies) from having “privileged access” to the financial institutions; and Article 125 prohibits the ECB from assuming any liabilities or “commitments” of the Member State governments (etc) – the famous ‘no bailout’ clause. But a recent report from the Corporate Europe Observatory (CEO) – Open doors for forces of finance – (published October 3, 2017) – suggests that the ECB feigns independence and is in fact captive of the largest profit-seeking financial institutions that sit on its advisory groups. In other words, the ECB has become a vehicle to advance private return and avoid regulative imposts when the TFEU outlines an entirely different role for the bank. I have regularly noted that the ECB has, in fact, been violating the no bailout clause since May 2010 when it introduced the Securities Market Program, which involved it buying the bonds of many distressed Member State governments in order to bring down yields that had started to increase (dramatically in some cases). It is also a fact that the only reason the Eurozone has survived and none of the 19 Member State governments have become insolvent is because the ECB has continued to systematically break the law as set out in the Articles of the TFEU noted in the Introduction. Sure enough, the defenders of the system claim that Article 125 does not prohibit the ECB from buying Member State debt in the secondary market (once it has been issued). But the reality is that the buyers of the debt in the primary issue market know full well that they can then onsell to the ECB at a higher price than they paid, which amounts to the same thing as the ECB funding the government deficits. The charade is that the ECB is just buying massive amounts of government debt as a liquidity operation. But the amounts of government debt needed for these purposes are minuscule compared to the expansion of the ECB’s balance sheet since May 2010. It is quite clear to any dispassionate observer what is going on and rather comical to hear and read the ECB pretending otherwise. But the Corporate Europe Observatory (CEO) report raises a separate and no less disturbing feature of ECB operations. 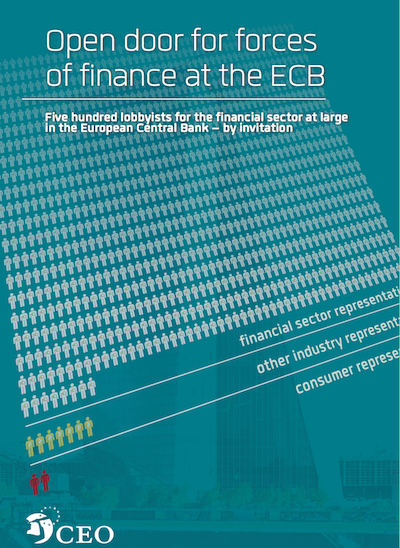 This is the front cover of the Corporate Europe Observatory (CEO) Report – it is very stark. There was also a very detailed analysis of the CEO Report in the French independent news service Mediapart (October 18, 2017) – La BCE «capturée» par le monde financier, accuse une ONG (“NGO accused ECB of being captured by private financial sector”). If you read French, it is an excellent account of the problem. ECB is arguably the most powerful institution in the euro zone. Its decisions have an impact on the lives of more than 400 million Europeans. Of course, there is its monetary policy, and all its consequences on the economy. But in the wake of the financial crisis, it has expanded its role far beyond its primary mission: to ensure price stability. The change was surreptitious, without anyone really appreciating the measure of the immense political powers now attributed to it. The ECB became a permanent member of the Troika and the European Stability Mechanism, deciding the austerity policies of European countries in difficulty. It is also responsible for ensuring the supervision of the European banking system, with the right to life and death over the banks and thus the depositors’ money. It is also the arena for financial regulation in Europe, which is Europe’s voice in international fora on all regulatory issues. The ECB’s power is disturbing in the sense that its decision makers are unelected and largely unaccountable. It does have to provide reports to the European Parliament but it mostly does what it likes. Which brings us to examining what ‘it’ means? That is what the CEO Report brings into the spotlight. It matters how the European Central Bank (ECB) makes its decisions, and it matters who it considers its experts and advisors. Especially if those advisors bear all the traits of lobbyists for the financial sector, and not least when the ECB is becoming a more and more powerful institution … Yet an incredible two thirds of the banks and financial entities under ECB supervision hold 346 seats in its own advisory groups, and this is just the tip of the iceberg when it comes to conflicts of interest between the role of the ECB and those whom it chooses to advise it. … the ECB has undertaken no reforms whatsoever. The ECB seems to live in its own bubble, setting its own low standards on key ethical issues. We argue that situation is not sustainable and needs to be addressed. According the ECB, these groups help it to “discharge its mandate” and “explain its policy decisions to citizens”. The ECB claims they access these ‘indepedendent specialists” in order “to maintain the necessary dialogue with representative associations and civil society”. Would anyone be against engagement with the public per se? Hardly. But the message from the ECB is misleading if we agree that “civil society” implies a variety of interests, some economic, some non-economic, some with links to companies and corporations, some that represent other interests. When looking at the advisory groups of the ECB, it quickly becomes clear that the composition of these groups are not representative of the public, and digging a bit deeper, reveals no attempt is made to ensure representation of interests outside the private financial sector, nor is the ECB interested in gathering inspiration from independent academics. All groups but one are completely dominated by financial corporations, and the number of seats taken by the private nancial sector is an astonishing 98 per cent (508 out of 517). Does this mean the ECB is captive of the big financial institutions? The CEO concludes that the way that the ECB has handled some “financial scandals and serious reform proposals” suggests it has been captured by these lobbyists. The ECB has ignored the criticism that it is being advised by the very sector it helps to regulate. 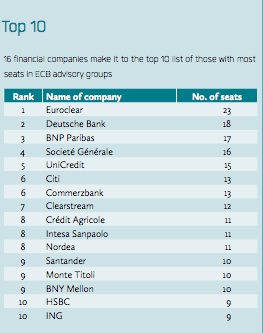 This graphic taken from the Report shows the Top 10 seats (held by 16 financial companies) on the advisory groups. The CEO Report concludes “that the ECB is making no attempt to secure participation from groups outside the private financial community”. We learn that these advisory groups are not intended to have “expertise” – they are constructed to represent “seniority” and the interests of the firms involved. The CEO Report provides several examples of how these groups have captured ECB decision making. 1. Financial Transactions Tax – where the ECB took a soft line. 2. The Libor Scandal – where the ECB promote self-regulation – the crooks regulating the crooks. 3. Foreign Exchange Scandal – “world’s biggest banks were manipulating currency exchange rates in order to make a solid profit from clients” – the ECB created the “Foreign Exchange Contact Group to handle the European side of the scandal and develop an ac- tion plan” but stacked it with representatives from the “banks involved in the scandal”. 5, Asset purchases – the QE program has delivered “billions of euros” into the hands of the institutions represented on the Advisory Groups. Volkswagen and Ford joined a working group in 2010 to help develop a template for reporting on car loans, in order to increase transparency and improve risk assessment. In the following years, Volkswagen enjoyed the support of the ECB for its financial arm, including through ECB purchases of ‘auto ABS’, securities backed by auto loans. So, first the ECB allows VW to help standardise its financial products, then it buys the same products on markets. These purchases were so extensive that it became a liability for the ECB when the Dieselgate scandal broke – with the discovery of fraudulent software in Volkswagen vehicles to hide the scale of vehicle emissions. The CEO Report also concludes that the ECB demonstrates “No broad commitment to transparency”. Citizens can, and indeed should, expect the EU decision-making process to be as transparent and open as possible. However, the ECB “is not formally involved in the register” and has adopted none of the procedures laid out by the Register. A large proportion of the “experts involved in its groups … are not registered”. Further the ECB does not recruit members of its advisory groups “in an open, inclusive manner”. As the French Mediapart story concludes “La BCE est indépendante de tous sauf du monde de la finance” – the ECB is independent of all but the financial sector! That should not surprise us. The ECB has consistently operated to advance the interest of the wealthy and at the same time has been party (via the Troika) to the destruction of the well-being of the ordinary citizens of the Eurozone. Its expert groups are dominated by the corporate sector – in particular, banks – which the CEO Report describes as being “outrageous”. The ECB “shows no concern for other interest groups in society, and seems utterly uninterested in getting independent academic expertise involved”. Who would want to be part of this type of system? The matter has already been in front of the ECJ and they widened the scope of interpretation in the treaty. The famous napoleonic fudge facility within their law system, proportionality, thus gives the ECB the scope to do what they will. “111. In any event, the Court finds that the features of a programme such as that announced in the press release exclude the possibility of that programme being considered of such a kind as to lessen the impetus of the Member States to follow a sound budgetary policy. 112 In that regard, it must be borne in mind, first, that the programme provides for the purchase of government bonds only in so far as is necessary for safeguarding the monetary policy transmission mechanism and the singleness of monetary policy and that those purchases will cease as soon as those objectives are achieved. 113 That limitation on the ESCB’s intervention means (i) that the Member States cannot, in determining their budgetary policy, rely on the certainty that the ESCB will at a future point purchase their government bonds on secondary markets and (ii) that the programme in question cannot be implemented in a way which would bring about a harmonisation of the interest rates applied to the government bonds of the Member States of the euro area regardless of the differences arising from their macroeconomic or budgetary situation. Whether the scope creep since 2015 has pushed the boundaries of proportionality has yet to be tested in court. I suspect the ECJ, if it ever responds to being asked, would just push the boundaries again with even more weaselly words. All of which just goes to show what a sham constitutionalism is. It’s just a way for those with money to get what they want. Thanks for a terrific up-to-date analysis of the ECB. It looks like the whole of the EU has already been captured by the super-rich and the citizens have a battle on their hands to get it back. The complicated financial double-talk that confuses the issue, and the corrupt officials agreeing to bend the rules, makes this hard to understand for the ordinary citizen. If you have an idea to make the corrupt be personally liable for their deviousness and acting against the interests of the people I would be interested to hear it. No big surprises here,The US Fed is also suborned to the Banking fraternity, They all have a common thread runnning thru’ them. EX-Goldman Sachs personnel are at the pinnacle of most Institutions , Mark Carney at BOE and Mario Draghi at ECB for instance. It is a club. “The German constitutional court that raised the issue has just sat on the problem and is now refusing to hear challenges, sloping shoulders to the ECJ which is dragging its feet”. If I recall correctly from my long-distant squarebashing days I think your intended allusion was to the command “slope arms!”. However I surmise that the shoulders of the esteemed jurists in question are probably so sloping that if they ever did slope arms those arms would promptly slide off. So it comes to the same thing either way. The above should have been addressed to Neil of course.